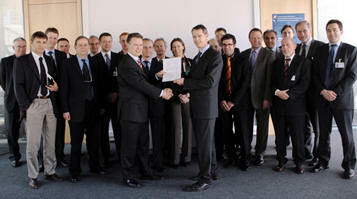 September 15, 2009, The Management Board of the European Aviation Safety Agency (EASA) today welcomed a common position of EASA and the European Commission setting out priorities for the extension of the Agency’s responsibilities in the areas of Flight Crew Licensing, Air Operations and Third Country Operators (“first extension”) as well as in the field of Air Traffic Management/Navigation Services and Aerodromes (“second extension”). Taking into account the comments of airlines, pilots and other stakeholders in response to EASA’s consultation documents (“Notices of Proposed Amendments”), the joint position intends to amend and simplify the Agency’s initial proposals in a number of areas. “We have listened to our stakeholders and agreed on an approach which will allow for a smooth transition”, said Patrick Goudou, the Agency’s Executive Director at today’s Management Board meeting. “Our proposals will be based on existing legislation and safety standards”. Zoltan Kazatsay, Deputy Director-General for Energy and Transport of the European Commission said: "Changes to existing rules will only be proposed if justified by safety considerations". Michael Smethers, Chair of the Management Board, commended the Agency and the Commission for their work. “These proposals represent a constructive response to the issues raised by stakeholders, and a sound platform on which EASA can prepare to carry out its new functions”, he said. The Management Board acknowledged a change in the structure of the Air Operations proposal, which will include dedicated sections for different types of operation. It also agreed to a phased publication of Agency proposals, giving priority to Flight Crew Licensing and Commercial Air Transport (CAT). The CAT proposal will contain specific provisions for Flight Time Limitations based on Regulation 1899/2006 (“EU-OPS”, Subpart Q), operational experience and current research and will take into account initiatives by the International Civil Aviation Organization (ICAO) in the area of Fatigue Risk Management Systems. Transition phases of 1-2 years will allow Member States and industry to better adapt to the new rules. The Agency is also committed to a streamlined comment review process which highlights the changes in the regulatory text and guidance material. All EASA opinions related to the first extension will be published by mid-2011 so that the respective Commission regulations can be adopted by April 2012. The implementing rules for the second extension shall be adopted by the end of 2012 (Air Traffic Management/Navigation Services) and 2013 (Aerodromes) respectively.